I was recently talking to an Indian friend who resides in America – he has been harping about coming back to India (Majority of them do, but very few actually come back). During our conversation, I realized one thing – He (like many others) is not very confident about prospects in India back home. Yes, it is true that India is one of the fastest growing nations and agreed that it is currently the land of opportunities, but do you think India can even be half as advanced and prosperous as US even in next 50 years ? He went on to justify his point giving examples of Indian Infrastructure, Common man’s mentality, Corruption at every step of the way (CWG was his prime target), government’s apathy towards entrepreneurship etc etc… His point was – He wants to come back to India, but all these ground realities don’t allow him to. I listened to everything he said and honestly nothing he said was wrong. There is no doubt we have problems in plenty, but there are also many things that make us tick. Like in most cases – our conversation ended with status quo. Both agreed and at the same time disagreed. 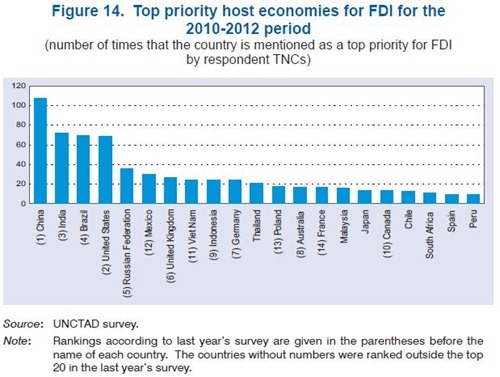 Today morning, I came across this report which mentioned that India is the second most favoured FDI (Foreign Direct Investment) destination in the world just behind China. Foreign Individuals and Companies across the world view India as one of the countries with most potential and they are betting by putting their money on India. Are we, the Indians, betting on India as much as the foreigners are? On a recent trip to India i found out that some progress has been made in terms of infrastructure. However, it would be some time before Indians can match the living standards of even the most modest European countries. Another thing that is typical to many Indians is their belief that since their culture is ancient it must have the answers to everything and they need not look at other countries to learn. This is the type of arrogance which can put the breaks in progress. As humans we should learn to respect and learn from other cultures. Many progressive Asian countries like Japan and S.Korea have succedeed by adopting things from western countries in recent years. The problem with us indians is we are not able to function as “intelligent” human beings on the planet earth. indian society is not allowing human intelligence to flower. It is only creating mediocre or even sub human individuals. It is simply inhuman, unintelligent and unacceptable to drive the way we drive on the roads, for example. People are not able to use even 10% of their intelligence while conducting anything in their lives – be it drive, walk, or do anything. The over population of the country is not helping at all. This is not criticism but simply stating the facts as they are. We need to really product conscious, intelligent human beings in this country. We need to wake up out of this deep rooted retarded human reality that we have created for ourselves which is neither beneficial to the self nor your immediate neighbour. Lets dig deep into our culture to see answers to these questions – indian spirituality, consciousness, intelligence, awareness whatever you can call it. This re-awakening has to happen in India! Yes, people bet on India but as a money making machine. They wont live here . So they are least concerned about rest of issues.Economic growth itself wont help us go forward. A more holistic approach is needed for that. We need money for country not country for money. Investing in India and coming back to settledown are two different angles. The investment angle sees the facts that west is saturated for expansion and the developing nations have potential for growth. But dreaming of coming back to settle down is different angle. Those who are living abroad have experianced hardships in India (Lack of infrastructure of any kind comparable to west be it roads, schools, hospitals, standard of living etc) and after living abroad and with families and growing kids, the only thing that scares them is they loath the idea of their children facing same problems which they faced. The problems can be anything like the failure of governence, corruption, voilence duirng unrest, police excesses, strikes, unruly traffic, unhygenic living conditions, and the provisions which you get in kirana which is unreliable for purity some times dangerous for health. But at the same time they fondly remember living among big families where aunts and uncles, cousins take care of you when u r in trouble, the dadima ke haath ka khana, and all those emotional bonds etc and etc. So all teh while keeping their kids safe in west they also repent keeping their kids away from the cultural experiance. The best scenario they wish is for the infrastructure to grow to international standards and at the same time have access to all those emotional things mentioned above. The growth of Indian economy is only due to enter-pruners.They adjust with corrupt politicians and bureaucrats for doing their business and prosperity of India.Our brilliancy has no par in the world but corrupt and blind visionary politicians and abetting bureaucrats causing hampering civil progress of india. This corrupt layer of our society is ruling our country only to stash money in swiss banks. illiterate,corrupt and greedy layer must be vanished by changing the present system for correcting the malady. There are two important & separate parameters to be considered. One is India’s economic growth and the other is India’s civil growth (for what we call it Living Standard). So when it comes to bet on India’s economic growth, niether the foreigners nor the Indians doubt about it. It is going to be a major or may be doinant power. But when it comes to civil growth- infrastructure, governance, education quality etc., I think, we all are skeptical about it.. It is true that Indian economy is growing, but at the same time there is some problem with the civil growth as compare to the developed countries, Government took the some initiative to work on the civil growth. Do you think India’s economic growth is not dependent on its civil growth ? Till India dont have a good civil growth, its econimic growth will always be in troubled waters.